Angelina Wintonick is a 16 year old junior at Colonia High School. She has lived in Colonia her whole life, from attending Pennsylvania Avenue School #27 for elementary school, to moving into junior high at Colonia Middle School, and now attends Colonia High School. Angelina enjoys many things, from sports to movies, photography, shopping and hanging out with her friends. But most importantly, she enjoys playing volleyball, a sport she has loved since she was in third grade. She plays on the high school team here at CHS, and plays club volleyball for a national team, outside of school. The team she plays for is ranked number one in the region and in the state for the past two years, and she aspires to continue her volleyball career through a scholarship into college. 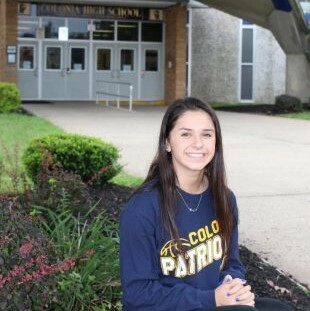 When she isn't playing volleyball, she enjoys hanging out with her younger sister, who is a sophomore at Colonia, or reading books along the genre of suspense and or thriller.